We're back in Arches National Park again! The summer Upward Bound students are learning about the geology of Arches and Canyonlands for their Geology Field Studies course this summer. The first morning we learned how arches form and why arches are so common here. 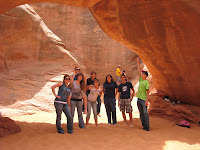 This is a picture of the class at Sand Dune Arch. In the afternoon we hiked to Delicate Arch. Saturday was a guided hike in the Fiery Furnace in the morning, fossils, faults and petroglyphs in the afternoon. Sunday we visited the Island in the Sky District of Canyonlands National Park and Deadhorse Point State Park.